Fundraising is essential to the success of nearly every 501(c)3. Even nonprofits that have sustainable sources of public-sector funding need to raise money—but raising money is a lot easier said than done. That said, your board of directors can be powerful fundraisers. After all, your directors have a passion for your mission and have chosen to give their time to your cause. Even if they haven’t (yet) donated a single dollar, their talent and expertise reflect a significant contribution. If your nonprofit chooses to, it can harness that talent and dedication toward strengthening its bottom line. Here are a few best practices your organization can implement that will help turn your board of directors into powerful and effective fundraisers. 1. Make sure directors understand fundraising expectations. Some nonprofits have an expectation that board members raise money for the organization. Occasionally that expectation even has a specific dollar requirement. Other nonprofits do not require board members to be fundraisers. When it comes to fundraising and your board of directors, there is no “right” way to do it, so long as your directors understand what is expected of them. Identify fundraising expectations as soon as a new director joins your board. One way to do that is by conducting an orientation for new directors, which, regardless of fundraising, is a best practice your board should immediately adopt. 2. Prepare your directors with a compelling message. If board members are expected to raise money, they must be equipped with a compelling message that highlights how your organization makes a difference in the community. Of course, directors can and should customize that message to appeal to individual prospective donors. What resonates with one donor may not resonate with another. Still, directors should start their fundraising activities armed with a consistent message that will help prospective donors understand the return on investment (ROI) they will get by contributing to your organization. Board members who are willing to fundraise are a precious commodity. Asking directors to contact donors, leverage personal and professional relationships, and develop the fundraising pitch is a lot to ask. Make your directors’ fundraising job a little easier by giving them an effective fundraising pitch to work from. 3. Be conscientious about how you are managing your directors’ time. Your directors only have so much time to give to your nonprofit. Be strategic about how you utilize that time. In other words, every moment a director spends sorting through paperwork, attending meetings that are longer than they need to be, or engaging in mundane administrative or operational tasks is time they could be spending on raising money for your nonprofit. Luckily BoardPaq has designed a board portal that makes serving on the board of a nonprofit as efficient and convenient as possible. Our platform allows your directors to spend more time on truly value-added activities like fundraising, and less time shuffling through bulky board binders to prepare for your next meeting. • Tasks, BoardPaq’s home screen feature that tracks individual member tasks to complete for each meeting, reminds directors to complete assignments from prior meetings, and allows directors to review and comment on draft minutes as well as respond to RSVP meeting requests. • One-button Download allows users to access the most up-to-date content and to download all available meeting documents with one touch. • News and Announcements provides your directors with the information they need to know ahead of your next board meeting. • Meeting Calendar gives directors easy access to upcoming meetings as well as past meeting materials and automatically displays meetings for the current month. In addition to these (and many more) time-saving features, BoardPaq is the only board portal with a built-in SWOT (strengths, weaknesses, opportunities, and threats) analysis tool. This unique feature will help your board create a strategic plan that will guide your organization and your board of directors through a successful fundraising campaign. These features and more are available in the most affordable and value-added board portal available to cost-conscious organizations. 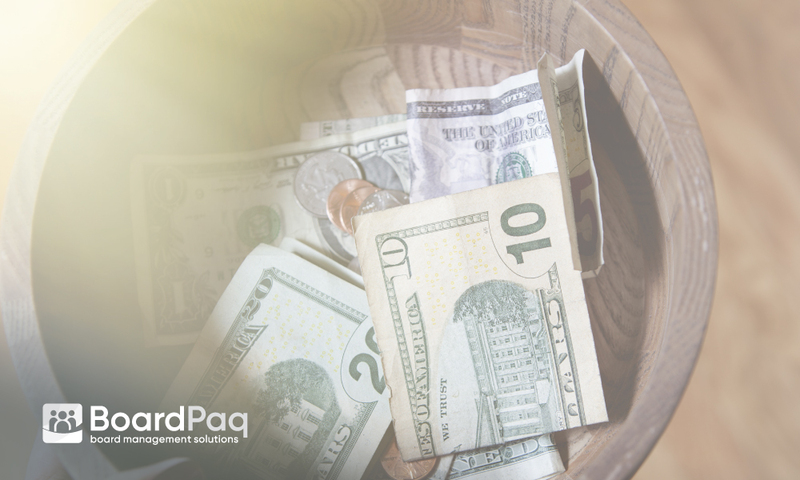 That’s why so many different types of nonprofits, including community-based organizations, trade associations, rural cooperatives, economic development agencies, and colleges and universities use BoardPaq to run efficient, paperless board and committee meetings. Interested in learning more about the board portal of choice for your nonprofit?